He has always been interested in Pacific health and addressing the needs of Pacific communities, says Dr El-Shadan (Dan) Tautolo. As director of the Centre for Pacific Health and Development Research, he manages the Pacific Islands Families (PIF) Study, which has been following almost 1,400 Pacific children and their parents since the children were born at Middlemore Hospital in South Auckland in the year 2000. The interaction with research participants is what he enjoys most about his work, Dan says. AUT is an exciting place to work, says Dan who has been at AUT for ten years. “The number of Pacific academic staff is increasing, and AUT is actively engaged in becoming the university of choice for Māori and Pacific students. He appreciates the opportunities staff have access to at AUT, Dan says. The AUT South Campus is the perfect base for his work and research, Dan says. 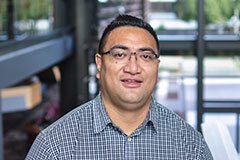 “The AUT South Campus in Manukau is a great place to work. It’s a vibrant and diverse environment, exuding a positive energy fuelled by the large number of Māori and Pacific students studying on campus.